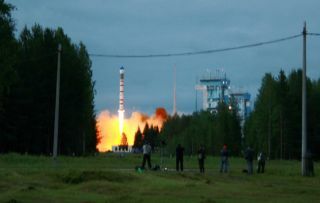 A Kosmos 3M rocket launches the German-built SAR-Lupe 2 satellite into space the Plesetsk Cosmodrome in northern Russia on July 2, 2007. A Kosmos 3M rocket launched from northernRussia overnight to place a military navigation satellite in orbit more than600 miles above Earth. The two-stage launcher lifted offat 0105 GMT Tuesday from pad 132 at the Plesetsk Cosmodrome in northern Russia.The launch occurred at 5:05 a.m. Moscow time. The mission's secret payload arrived in orbitabout one hour later at 0208 GMT, according to the Russian Novosti news agency. U.S. tracking data shows the satellite wasreleased in a nearly circular orbit more than 600 miles high with aninclination of about 83 degrees. The spacecraft was named Kosmos 2463 underthe Russian military's naming system for defense satellites. Russian officialsdid not disclose any more details on the satellite's mission. But the payload is believed to be a Parusnavigation and communications satellite for the Russian Defense Ministry. Theorbit reached during Tuesday's launch closely matches the operational locationsof Parus satellites. In a Russian media report earlier this month,the commander of the Russian Space Forces said the Kosmos 3M rocket will beretired later this year after a handful of final flights. Kosmos 3M rockets have launched more than 400times since the 1960s. Tuesday's blastoff was the 10th Russian space launch in2010 from Plesetsk and the Baikonur Cosmodrome in Kazakhstan. It was the 17thlaunch to successfully reach orbit this year from sites around the world. Copyright 2010 SpaceflightNow.com, all rightsreserved.